Survey forms are now available and can be completed online by clicking on the link to the right of screen. Council is seeking your opinion on different opportunities available to upgrade community and cultural facilities in Springwood, and ways to fund this work. A review of the community and cultural facilities in Springwood was completed in April 2010. This review has assessed the existing community and cultural facilities in Springwood and examined the feasibility and requirements to upgrade these, which have long been identified as needing significant improvement. In 2007, Council commenced consultation on the needs for community and cultural facilities in Springwood with service providers and main user groups. This has been undertaken with consideration of the requirements for future services, the space required for these services, feasibility of different options available and broad cost estimates. For more information, please refer to the Spatial Requirements for Facilities download at right. Options available to Council to deliver improved community and cultural facilities have been detailed in a community information brochure which can be downloaded from the panel on the right of screen. A survey (available from 14 May) which will be placed in the Springwood Library and Council office, on Council's website www.bmcc.nsw.gov.au and Blue Mountains Have Your Say via the link to the right of screen. A submission which should be marked Springwood Community and Cultural Facilities and either: Posted to the General Manager, BMCC, Locked Bag 1005, Katoomba NSW 2780; Hand delivered to Katoomba or Springwood Council Offices; or Emailed to council@bmcc.nsw.gov.au. Submissions from the community will be reported to Council at the end of the consultation period. Please indicate on your submission if you want your details to be withheld throughout the reporting process. The closing time for submissions and surveys is 5pm, Friday 28 May 2010. For all enquiries, please call 4737 5000. Do the existing community and cultural facilities in Springwood meet your needs as a user? Springwood's community and cultural facilities are all heavily used but reflect last century's standards - the Civic Centre 1966, the Library 1975. 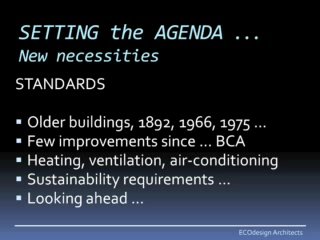 They do not meet current standards for space, comfort, public access, sustainable energy or water use. Upgraded or new facilities that meet future needs are required, whether that be through re-building existing or other nearby sites. This is the challenge now facing Council and the community. Would you prefer to see existing community and cultural facilities upgraded or new facilities constructed? To provide the community with an idea of what might be possible in terms of community and cultural facilities improvement in Springwood, Ecodesign Architects have developed two options for upgrade. Fundamentally, option A involves upgrade of existing facilities on the Civic Centre/Library site while option B proposes the construction of new facilities on the Council owned carpark south of the Town Square. Alternatively, a combination of both options may be considered as a plausible way forward. A range of funding options for improving community facilities will need to be explored. How do you feel about the various funding options discussed in the community information brochure? In order to proceed with any type of upgrade to the facilities, Council will need to establish how such a project could be funded, and even if it can be funded at all. In doing this the Council will need to investigate in detail, options such as loans and major grants, income generating activities, trust funds and donations, cooperative development projects including possible return on assets, or a combination of the above. Different approaches will need to be considered in order to find a 'best fit' between the costs of upgrading facilities and the funding capacity of the Council. Staging of any development may be possible. Information package received by households in the Springwood District (Warrimoo, Sun Valley, Valley Heights, Springwood, Yellow Rock, Hawkesbury Heights, Winmalee and Faulconbridge) and placed on BMCC website and in Springwood Library and Council offices. Survey on website, independent online consultation forum, Springwood library and Council Offices.